The Golden Triangle RC&D believes it’s a combination of factors that make a community great. Clean air and water, vibrant parks and recreation areas, active citizen involvement, great schools, effective social services, and a spirit of local pride all factor into making a community one we want to call home. Working through our mission and vision, we have created a self-funded investment program which works to assist the residents in our service delivery area to achieve a sustainable natural resource base, increase social and economic opportunities, and improve quality of life. This program endeavors to make a positive difference through targeted grants to causes and organizations that help advance the social, economic, educational, environmental, and agricultural interests of cities and counties in the communities we serve. Preference is given to organizations in our service delivery area that can demonstrate clear, measurable results toward stated objectives and a solid track record for success. The counties in our service delivery area include: Baker, Calhoun, Clay, Decatur, Dougherty, Early, Grady, Miller, Mitchell, Randolph, Seminole, Stewart, Terrell and Worth. The Community Grant Award is usually offered in a Request for Proposal once a year. Please check our website for the dates of the next round of funding, current grant guidelines, and applicable due dates. 2017 Winner - Clay County Family Connection, Inc. This grant was used to help teach children to swim and provide boating and water safety classes. The grant was used to purchase a Phantom 4 Pro drone with a camera and software that will aid in early disease, pest and erosion detection. Students used the grant to create unique stepping stones that will provide aesthetic pathway to the garden and help prevent erosion. The grant will be utilized to purchase a picnic table and benches as part of the Weston C. Lee Memorial park renovation in honor of the hometown hero killed in 2017 serving with the U.S. Army in Iraq. The seating and eating area will improve accessibility and usability for park visitors. The grant will be used to educate students on campus while providing educational, recreation, and health benefits to the local community. The garden will be used for educational and recreational activities on support of the Regenerative Agriculture and Timber Management programs. The grant will be used to help the county 4-H establish and maintain a series of garden plots to be used as a teaching tool. The garden will be utilized by students and families of a low-income county to provide valuable information and education. The grant will be used to help finance a multiple window display that would reflect the history of the community "at first glance". Signage, enlarged photos of community landmarks, along with vintage photos will help the Museum increase its exterior presence in downtown Cairo and become more recognized in the community. The grant will be used to make improvements to a student garden designed to increase children's knowledge of where their food comes from, facilitate a healthy lifestyle, and encourage accountability to natural resources. Teachers integrate student lessons to include the garden and nutritional staff impart farm to table concepts to the students. 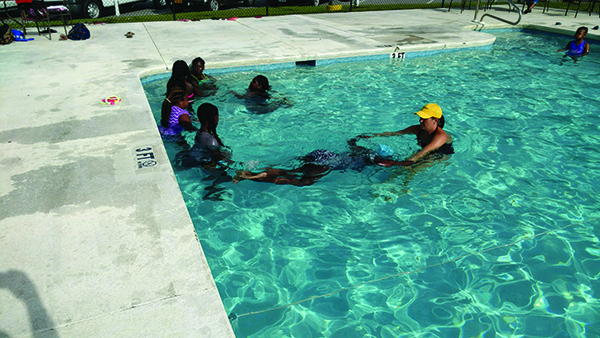 For the third consecutive year, Golden Triangle provided a grant to help mitigate drownings in Walter F. George Lake through providing swimming lessons and water safety to low income children of Clay County. These services are provided based on the suggestions of The Child Fatality Review Committee. The grant will be used to build a kiosk at the entrance to the Preserve walking trail in order to provide information about the property and various rare plants in bloom. Trail markers will also be crafted and posted to guide the visitor through the 15+ acres of trout lilies, trilliums, orchids and variety of hardwoods in that section of the Preserve. The grant will be used to support the execution of a unity initiative to bring county citizens together. A group of volunteers has been organized to select one or two projects for the common betterment of the county. The grant will specifically cover marketing, organizing a climax meeting and other supplies and equipment. The grant will be used to acquire equipment to make professional signage to raise awareness, promote community meetings and forums, as well as market Chamber events and promotions. This will serve the purpose of facilitating tourism, community promotion, increasing participation in community events. Following a grant through Golden Triangle during the previous year to set up a series of four raised bed gardens, this year's grant will be used to purchase a SunLite Starter Kit to grow seedlings. The purchase will make the garden completely self sustaining and able to grow enough produce for the school cafeteria. This will add another layer of instruction and learning for the students, allow them to expand the garden, increase their impact on the school and the community, and reduce their carbon footprint. The grant will be used to improve the community appearance and upgrade the streetscape for the community of Morgan. The grant will be used to support an effort to paint building fronts, install doorway awnings, and plant flowers with a goal towards drawing more tourism and business into the county. The grant was used to construct a work station equipped with a sink, storage cabinets, power sources, and an awning. This area will serve the garden and DIY/Life Skills classes. The grant was used to build a kiosk at the Hadley Ferry Boat Landing to provide information about the river, water conditions, paddling opportunities and safe boating/fishing practices in order to promote eco-tourism in Grady County. Clay County Family Connection, Inc. The grant was to provide a similar program to the one the group implemented last year. It taught children to swim and provide boating and water safety classes. This project is a collaborative effort between the Clay County Family Connection, Clay County Commissioners, George T. Bagby Lodge, The U.S. Corp of Engineers, local churches, and local volunteers. The class provided lessons for 20 students. The monthly food bank serves an average of 375 families in Miller and Baker Counties. Food is received from Second Harvest Food Bank in Thomasville, GA. and distributed from the Colquitt location. They were unable to accept much in the way of frozen food due to storage imitations. This grant was used to purchase 2 freezers that helped to alleviate the storage issue and provide the families with a much improved selection of frozen foods. Since 2013, over Columbus Day weekend, Flint Riverkeeper and Georgia River Network’s Paddle Georgia project partner to offer a three day camping and paddling experience on the lower Flint River. The goal is to provide educational and recreational opportunities for up to 125 paddlers. The grant will be used to support youth participants in the event. It will cover registration and other expenses for a certain number of high school students and their teachers to participate in this educational event. This grant allowed an intern the opportunity to experience social media, grant writing, research, media releases, and other digital marketing avenues. The intern prepared a portfolio to include the documents listed above and be able to present the portfolio to prospective future employers. Albany Area Primary Health Care (AAPHC) hosts an annual community wide health fair in Dougherty County to provide health screenings and health resource information at large in Albany and surrounding communities. AAPHC seeks to grow this event to reach even more individuals who otherwise may not have health screenings or be aware of resources that are available to them. Additional health screenings and more patient information were provided for through this grant. Miller County has hosted the annual Mayhaw Festival for 34 years. New signage has been needed to help promote this festival and increase tourism through the historic Southwest Georgia community and was paid for through this grant. The festival drives people to the downtown area and has a major positive impact on the local economy. CHIEF DEAN KING AND OTHER MEMBERS OF THE SEMINOLE COUNTY FIRE DEPARTMENT STAND WITH THEIR NEW CHAINSAWS, FUNDED THROUGH THE GOLDEN TRIANGLE 2018 GRANT. In recognition of the hard work and necessity of Southwest Georgia's rural fire departments, we launched a small reimbursement grant program. One volunteer fire department from each of our service counties can apply for a $1,000 reimbursement* grant to cover supplies and/or training events in support of their mission. The first round of the grant closed on June 1st, 2018. Check back in 2019 for more info on next year's grant opportunity. *Reimbursement grants are disbursed to award recipients for expenses incurred after grant agreement has been signed.